"As the number one producer of lentils in the U.S., it makes perfect sense to honor the Midwestern state with this delicious dip. 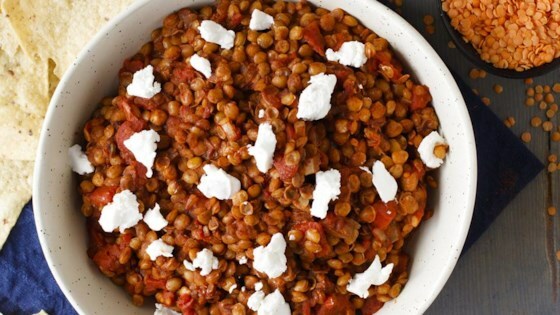 The flavors of McCormick® Original Chili Seasoning Mix, canned lentils and tomatoes create a chunky, hearty base. Sprinkle goat cheese or feta on top and enjoy with tortilla chips or fresh vegetables." Heat oil in large skillet on medium heat. Add onion; cook and stir 2 to 3 minutes or until translucent. Stir in lentils, tomatoes and Seasoning Mix. Bring to boil. Reduce heat; cover and simmer 10 minutes, stirring occasionally. Spoon into serving bowl. Sprinkle with cheese. Serve dip with baked or low-fat tortilla chips or cut-up fresh vegetables.